What to put in my children’s baskets this year… I feel when my kids were younger it was so easy to find cute little trinkets from the store to add. While searching the aisles this week, I felt they were a little too young for my 5, 8 and 10 year olds. Should I buy a pre-made Easter basket and let them all share? How easy to have these gourmet baskets just delivered to my door. 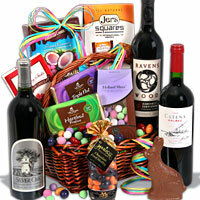 Better yet maybe the Easter bunny will bring me this Red wine and Chocolate basket. Now we are talking. Any adults out there still get Easter baskets? If so what is in yours? Maybe I should start a new tradition and start a basket giving to my husband and I. Unfortunately I think it will go down like the Christmas Stocking, I buy a bunch of little things and stuff it myself. Sending flowers is always a nice way to say you are thinking of someone, but in my opinion food is just as great and nourishes the soul. Don’t worry if you don’t pick each item yourself, I find I spend just as much if not more when I attempt to save money on a present, that I am try to replicate. So Easter Bunny if you are reading my blog feel free to stop by and deliver me a gourmet Easter Basket this year, I promise I will share.